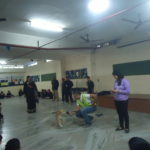 Round Glass Foundation, a community organisation, working in cities and villages of Punjab, crafting co-existence and eco-sustainability organized a session with the students of SSICS as ‘How to stay safe and responsible around dogs’. 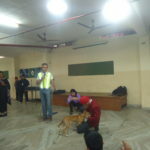 The resource person Mr. Inder Sangru, an expert, enlightened the young minds as to reduce animal and human conflicts. 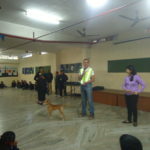 His co-fellows Ms. Neeti apprised the students about the behaviour and reactions of this most faithful friend of man in various situations. The need to annually vaccinate the dogs against rabies was re-iterated. The spirit of compassion and the aim of promoting co-existence between animals, human and environment to be made a way of life were the highlights of the session.